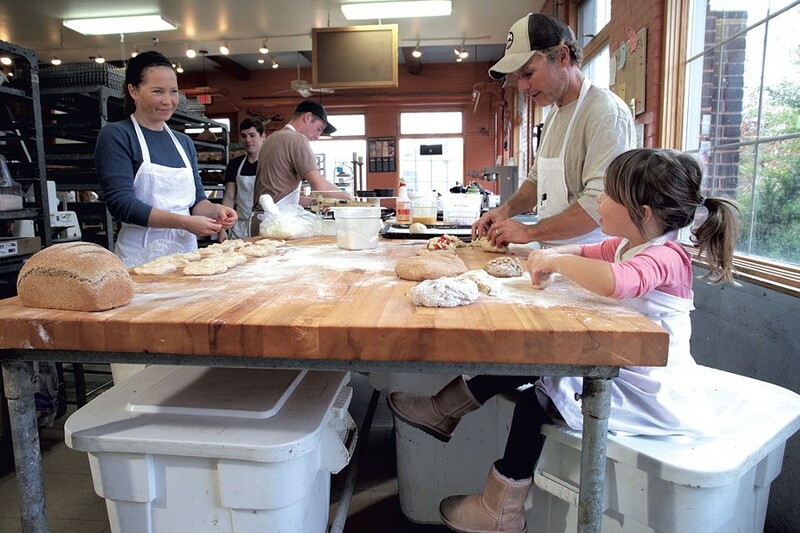 How the Owners of Great Harvest Bread Juggle Work and Family | Balancing Act | Kids VT - small people, big ideas! The Browns: Mom: Sara Brown, co-owner and staff and business manager, Great Harvest Bread. Dad: Ethan Brown, co-owner and production manager, Great Harvest Bread. Kids: sons Olin, 10, and Eamon, 7; daughter Eve, 4 (pictured). Ethan and Sara Brown met at Great Harvest Bread 15 years ago. Not the one in Burlington, where you can find them in flour-covered aprons with children at their heels five days a week — this one was in Missoula, Mont. Ethan, a D.C. native, worked research jobs in his hometown after college. The gigs paid well but weren't fulfilling. When he saw an opportunity to move to Montana, the avid snowboarder jumped at it. To pay the rent, he took a gig at Great Harvest Bread, a chain with 190 franchises around the country, and found that he enjoyed the lifestyle. Sara, who grew up outside of Atlanta, had come to Missoula for graduate school in education. The bakery was a block from her house, and she would stop there every morning to get a coffee on her way to class. The two fell in love and decided they wanted to open their own Great Harvest franchise. Sara took a job alongside Ethan so she could learn the ropes, then they embarked on road trips around the Northwest and New England to scout bakery locations. Burlington immediately appealed. Ethan, 48, and Sara, 40, got married in 2002, moved to Burlington's South End soon after and opened up their Pine Street Great Harvest location in 2003. Two years later, their first son, Olin, was born, followed by a second son, Eamon, in 2008, and a daughter, Eve, in 2011. Sara: I only took three days off with each of the boys. I deliberately took one week off after I had Eve, but with the boys I never took any maternity leave because ... I couldn't. It's not like I went back to working 40 hours a week, but I was there. I brought them with me, and they spent a lot of time in the bouncy seat and the Moby wrap, and it always worked. I never had to pump milk. I always had them at my side, all the time. It was out of necessity, but it worked. Looking back, I am grateful that I never had to put them in childcare. Ethan: We always joke that we know what sort of day each other has had but haven't really spoken. At the end of the day, over dinner, we can catch up. We are in each other's midst all day long, you know, but it's not like we're hanging out chatting. Sara: Despite the fact that we are about 40 feet apart, we have very different spheres here. They definitely overlap, but I can go hours at work without speaking to Ethan. Sara: Ethan is always in here by 7 a.m., so he's usually up and out before the kids are even awake. I have the kids in the morning, and I get them off to school, and then, typically, Ethan is home when the boys are getting home from school, and that's sometimes my most productive time of day. Ethan: For the kids, the bakery is this great, stimulating environment. It's funny, because by the time they start going to kindergarten, they're better socially equipped with twentysomethings than they are with other 4- or 5-year-olds! Sara: Usually we bring them in. Occasionally, one of us arranges to work a shorter day so they don't have to be in here that long, but we bring them in with a pillow and a blanket, and we lay them out on the couch [in the office]. They don't ask to stay home very often because they know it means they are going to come to the bakery! Ethan: They've never suffered from a bad infectious disease or something. If it was anything beyond a cold, we wouldn't bring them in. Sara: Oh, now we're really getting into tricky territory here! I do most of it. He does all the dishes. I make dinner every night. He certainly pitches in. I think I'm more domestically inclined, and I think, especially because our two oldest children are boys, Ethan does more of the direct childcare in terms of spending time with them, doing stuff with them after school, taking them to soccer practice, kicking around the ball with them in the park. Ethan: I'm not luxuriating somewhere while she's doing housework! I feel that there's joint active participation as parents on a number of fronts. Sara: We do what comes naturally and what we are inclined to, but, like a lot of modern families where both parents work, we haven't quite reached that same equity in the house on the domestic level. I do feel, however, that in my job I have a lot more flexibility, and I don't work as many hours a week as Ethan does. On the future of the bakery: Is it a long-term commitment or a chapter? Ethan: It's very much a chapter. Sara: We love the bakery, and it's been an amazing place to raise our family to this point. The desire to close this chapter in our lives comes mainly from me. I really want to get back to teaching. I want to have the same schedule as my kids and spend my summers with them. In fact, the bakery is for sale. No buyers yet, but there's been interest.